"I'm Barack Obama, and I approve this message." Voters are used to that tagline on political ads, and most get the idea behind the decade-old law requiring it in federal campaigns. Known as the Stand By Your Ad provision, it forces candidates to take responsibility for whatever facts or foolishness their TV commercials contain. Without it, the mudslinging might be even dirtier. Shouldn't the same principle apply to political ads made by people and groups who aren't officially associated with candidates and ballot measures but wield just as much influence in elections? It should. That's why Californians should encourage state legislators to support the DISCLOSE Act, a bill by two San Francisco-area senators that would require the top three funders of political TV and radio commercials and print and online ads to be boldly identified in the ads themselves. No fine print. None of the misleading names that special-interest groups like to go by. Instead, big, bold words right up front. SB 52 sponsors Sen. Jerry Hill and Sen. Mark Leno are right: Voters can't do much to reduce the money in campaigns, but they have the right to know which individuals, corporations or unions it comes from. 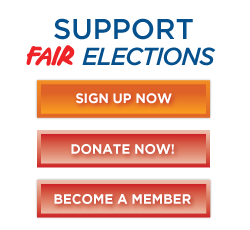 The DISCLOSE Act (it stands for Democracy is Strengthened by Casting Light on Spending in Elections) is part of the popular backlash against the loosening of political-donor restrictions by the U.S. Supreme Court's Citizens United ruling. In Sacramento, two other active bills, by Sens. Ted Lieu of Redondo Beach and Lou Correa of Santa Ana, take different approaches to helping voters to know who is advocating what. And in Los Angeles, the May 21 ballot offers Proposition C, urging L.A. elected officials and Congress members to support a constitutional amendment to overturn Citizens United. But the DISCLOSE Act is the effort with the most support and the most history behind it. Similar past attempts in Congress and the California Legislature have come up short, including a 2012 bill by then-Assemblywoman (now Rep.) Julia Brownley that was beaten back by nearly unanimous opposition from Republicans. California should lead the way on this reform. Many voters here were appalled when an Arizona nonprofit with anonymous backing dropped $11 million into two proposition campaigns. Under the DISCLOSE Act, an ad mostly paid for by money like that would have to say so. The 2013 DISCLOSE Act's next step is a hearing Monday in the Senate Appropriations Committee. If it reaches the full Legislature, it will require two-thirds approval, because it's an amendment to the 1974 Political Reform Act -- passed by voters. Californians should tell their lawmakers they approve this message: SB 52 would bring more vital transparency to state politics.